This week we met Motorola's Droid, the first handset with Android 2.0. To an outsider, it just looks like another Google smartphone, but 2.0 is more than that: it's proof that Android is finally going to take over the world. It&apos;s this simple: If you don&apos;t buy an iPhone, buy a Droid. So Wait, What Is Android, Exactly? In Google's words, it's "the first truly open and comprehensive platform for mobile devices." That doesn't mean much, so here's a breakdown: It's a Linux-based, open-source mobile OS, complete with a custom window manager, modified Linux 2.6 kernel, WebKit-based browser and built-in camera, calendar, messaging, dialer, calculator, media player and album apps. If that sounds a little sparse, that's because it is: Android on its own doesn't amount to a whole lot; in fact, a phone with plain vanilla Android wouldn't feel like a smartphone at all. Thankfully, these phones don't exist. The issue that's raised is the redistribution of Google's proprietary applications like Maps, GTalk, Market, and YouTube. They are Google's intellectual property and I intend to respect that. I will no longer be distributing these applications as part of CyanogenMod. This can lead to more mainstream (and confusing) issues, like with the, erm, touchy (sorry!) multitouch issue: Android OS supports multitouch, in that it can recognize multiple simultaneous input points on its screen. But Google's Android apps don't. So when a company like HTC comes along and decides to properly add multitiouch to the OS, they can only add it to the open-source parts, like the browser (or their own closed-source apps), not Google's proprietary apps. That's why the Hero has pinch-zoom in its browser and photo albums but not in Google Maps, where it's just as at home. Dissecting Apple&apos;s "Multitouch" Patent: Can It Stop Palm? The issue gets even less trivial as the apps grow more central to the Android experience. You know how Google Maps Navigation was, like, the banner feature for Android 2.0? Well, it was, but technically speaking, it's not a part of Android. It's just part of an app made by Google for Android, and that'll ship with most Android handsets. Except for in countries where Google doesn't have their mapping data quite together enough, where it won't. That's what's happening with the Euro Droid, which, by the way, does have multitouch in its browser, like the Hero. That's why the distinction matters. So, why take so much care to set up and protect this open source component, when surely Google could just slap together a closed-source mobile operating system and give it away for free, right? It would deprive handset manufacturers of their ability to freely modify certain core components of the OS, sure, but the real reasoning, oddly enough, has less to do with phones and more to do with, well, everything else. Handset manufacturers and wireless operators will be free to customize Android in order to bring to market innovative new products faster and at a much lower cost. Developers will have complete access to handset capabilities and tools that will enable them to build more compelling and user-friendly services, bringing the Internet developer model to the mobile space. We were a little disappointed that the GPhone wasn't strictly a phone, but like most people, this sounded exciting to us. Vague, but exciting. And so we waited, patiently. And waited. Then, nearly a year later, we got our hands on the first hardware to actually use Android. It was called the T-Mobile G1, and It Was Good. Then, six months later, we got another phone—the Magic, or MyTouch, which was more or less exactly like the first one, minus a keyboard. It wasn't until two full years since Android's first appearance—when not just HTC but Motorola, Samsung and Sony started showing off fresh wares—that Android began to feel like more than an experiment. And more important than getting fresh hardware, Android's OS had changed too. A lot. The T-Mobile G1 shipped with Android 1.0, which wasn't exactly missing much, but still felt a bit barebones. 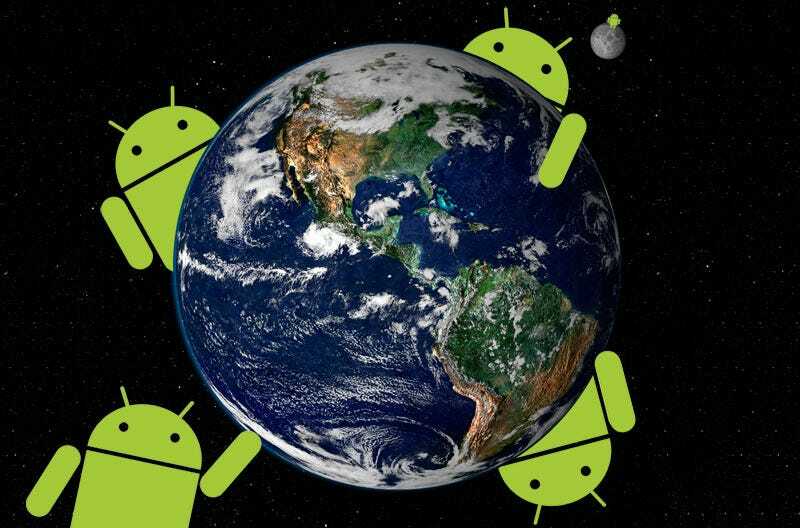 We had to wait until February of 2009 for paid apps to show up in the Android Market, after which April saw the first major update, Android 1.5 "Cupcake." (Updates each have alphabetical, pastry-themed codenames.) This was followed by 1.6 "Donut," which most new handsets are shipping with now, then 2.0 (yes, "Eclair"), which throws in social networking integration, an interface lift, support for new device resolutions, a fresh developer SDK and support for the optional Google Maps Navigation. This version is currently only found on the Motorola Droid, but should start showing up elsewhere with a few months. And so here we are. And that's just half of it. Android is not a single piece of hardware; it's a complete, end-to-end software platform that can be adapted to work on any number of hardware configurations. Everything is there, from the bootloader all the way up to the applications...Even if you're not planning to ship a mobile device any time soon, Android has a lot to offer. Interested in working on a speech-recognition library? Looking to do some research on virtual machines? Need an out-of-the-box embedded Linux solution? All of these pieces are available, right now, as part of the Android Open Source Project, along with graphics libraries, media codecs, and some of the best development tools I've ever worked with. Almost all the talk about Android over the last two years has been about Android the phone OS, not Android the lightweight Linux distribution. While Google was busy pumping out high-profile phone-centric updates, Android was starting to creep into other industries, like a disease. A good disease, that everyone likes! Yes, one of those. This is where things get weird. Remember all those not-quite-there Android netbooks? Part of the plan. The Android-powered Barnes & Noble Nook? Shouldn't have been a surprise. Android navigators? Why not? PMPs? Creative's got one. Photo frames and set-top boxes? Already in the works. Most of these devices won't look like Android hardware to us, because our strongest Android associations with the OS are all visual and phone-specific, like the homescreen, app drawer and dialer. Nonetheless, this is as much a part of the Android vision as phones are—it just won't be as obvious. Your Android-powered DVR won't have an app drawer, but it will share the kernel, and an unusually good widget system. Your Android-powered PMP may run a custom interface, but it'll have access to thousands of apps, like an open-source iPod Touch. Your Android-powered photo frame might look just like any other photo frame, but when it drops your wireless connection, it'll have a decent, full-featured settings screen to help you pick it back up. And over-the-air updates. And it might actually cost a few dollars less that it would have otherwise, because remember, Android is free. This is our Android future, and it sounds awesome. In time, Android very well could be the internet phone, hands down, in terms of raw capabilities.... Android 2.0's potential finally feels as enormous as the iPhone's, and I get kinda tingly thinking about it. What problems the phones still have—among them, poor media playback and the lack of a bundled desktop client to manage media—are not with Android but with Google, which is really just a major supporter of Android. Either Google will solve them hands-on, or the dream of the open source and app developer communities rising up to fill in all the gaps will become a reality. What's certain is that Google—or someone—needs to address them if future legions of Google-branded phones are to succeed to their full potential. Speaking of potential, it's massive. In addition to everything else Android has going on, timing is on its side. Windows Mobile is limping along with two broken legs, and its hardware partners took (or maybe gave) notice: Motorola, lately a pariah in its own right, doesn't want anything more to do with Microsoft; HTC is stating continued support while quietly phasing out the WinMo ranks; Sony Ericsson, which hasn't seen a true hit come from one of their Microsoft-branded phones in years, is dabbling in Androidery. And as far as most consumers are concerned, anything Windows Mobile can do, Android can do better. Ouch, when Motorola passes on you, things must be really bad. It doesn't stop with Microsoft, either. Symbian, whose boss called Android "just another Linux platform," is losing ground, and losing some of Sony Ericsson's business doesn't help. The Palm Pre, polished and beautiful as it is, can't keep up with Android's exploding app inventory, multiplying hardware partners and rock-star ability to draw talent. RIM's BlackBerry isn't generally seen as a direct Android competitor, but Android 2.0, along with Palm's WebOS and Apple's iPhone OS, are the main reasons the BlackBerry OS feels so clunky and old. That matters. From here, the outlook is clear: Android and the iPhone are the next consumer smartphone superpowers. Symbian Boss Calls Android Just "Another Linux Platform"
And even if it takes Google 10 years to iron out Android's faults and push this kind of adoption, you can expect Android, or its unofficial pseudonym "Google Phone," to become a household name. Besides, Android will start creeping into our lives in places we might not expect it. It'll power our settop boxes, ebook readers, PMPs and who knows what else. It's not just going to be the next great smartphone OS, it'll be the quiet, invisible software layer that sits between all our portable gadgets and our fingers. Still something you wanna know? Still mixing up your Androids and your hemorrhoids? Send questions, tips, addenda or complaints here, with "Giz Explains" in the subject line.